The new R8 V10 Plus represents the pinnacle of Audi’s halo supercar. In the seven years since Audi launched the R8, the automaker has kept their flagship sports car fresh by adding the roofless Spyder, the V10 and GT models, but this is the first time the lineup has been given a proper going over. Highlights of the revamped 2013 R8 range include subtle cosmetic tweaks, the addition of a 7-speed S-tronic dual clutch transmission across the range (replacing the awkward 6-speed automated manual R tronic), and a new range-topping V10 Plus model. Squint and you can just about make out a revamped fascia with new LED headlamps, and a six-point single-frame grille with horizontal chrome inserts that dress the struts of the V10 model. At the rear, the refreshed R8 boasts a redesigned bumper, a new set of LED taillights, a new R8 logo, restyled diffuser, air outlets with a trio of slats on each corner and two new round tailpipes. Interior changes are limited to modifications to the shift paddles, needles in the instrument cluster and trim. Diamond-stitched leather seats, door panels and headlining are offered as an additional option. The new seven-speed S-tronic transmission is the main talking point of the refresh. Utilizing two multi-plate clutches, gears are shifted directly, resulting in seamless shifts that take mere hundredths of a second to complete. The six-speed manual remains an option for purists. The R8 V8 coupe with S tronic sprints from 0-62 mph in 4.3 seconds, topping out at 186mph, while the R8 V10 with S tronic completes the sprint in 3.6 seconds and has a top speed of 195 mph. New brake discs reduces weight by 2 kg, and the facelifted R8 rides on larger 18-inch alloys for the V8 and 19-inch rims for the V10 models. Enthusiasts will be most enthused, however, by the new R8 V10 Plus, pictured here in matte blue. Taking its name from Audi&apos;s latest Le Mans racecars, the R8 Plus packs a tweaked version of the 5.2-liter V10 with 550 horsepower and 398 lb-ft of torque. 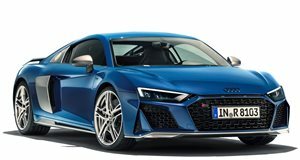 Essentially replacing the limited-edition R8 GT model, the new flagship is offered (at least at first) solely in coupe form and - equipped with the new dual-clutch gearbox - hits highway speeds in just 3.5 seconds en route to an increased top speed of 197 mph. Further distinguishing the V10 Plus are carbon fiber splitter, mirror housings, wider side blades and air vents, as well as special 19-inch lightweight alloys and a larger rear diffuser. Carbon-ceramic brakes, specially tuned springs and shocks, adaptive magnetic damping and LED lighting for the engine compartment complete the package. European customers will receive the overhauled Audi R8 by the end of the year, with prices starting at 113,000 Euros for the V8 coupe, 124,800 Euros for the Spyder, and 154,600 Euros and 165,900 Euros for the V10 variants, while the R8 V10 Plus comes in at 173,200 Euros. US deliveries of the revised R8 are expected at the start of the year.